Viewers could identify with Ariel, too. She was a flawed Disney “princess” who was all the more endearing because of her humanness (uh, fish tail notwithstanding). She disobeyed her father to follow her passion, she was talented but easily distracted and perhaps too trusting—and most importantly, she aspired to a life that was different from the one her father envisioned. 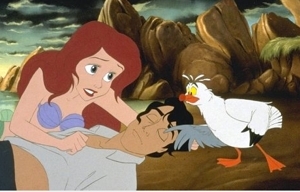 But she’s duped because of her wish to have legs so she can pursue Prince Eric, whom she saved from drowning. The Sea Witch, Ursula—one of the stronger Disney villains in the past several decades—gets her to sign on the dotted line of a Mephistophelean bargain. She will have legs for three days, during which time if she gets Prince Eric to kiss her she will have him—and those legs—forever. But fail, and she becomes another shriveled “pet” kept by this dark, big-bosomed, octopus creature in her own underwater Hades. 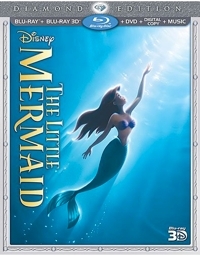 While it may have ushered in a new Golden Age of Disney animation with that blend of Broadway and more meticulous detail, The Little Mermaid was also the last animated feature from the House of Mouse to incorporate hand-painted cells and analog camera and film work. More than a million drawings were done for the film, with final artwork sporting roughly 1000 different colors and just as many backgrounds. It also has more effects than most Disney features, with effects animation supervisor Mark Dinal estimating that over a million bubbles were drawn for the film. The result? The Little Mermaid became the first Disney animated feature to win an Oscar (Best Score, Best Song) since Bedknobs and Broomsticks, way back in 1971. It’s good to finally have this one on Blu-ray—and in 3D, no less. I have to say that the 3-dimensionality is mostly confined to within the depth of the television set, with not nearly the “pop outs” that 3D fans expect. And it doesn’t have quite the same pop-up book look as Sleeping Beauty did. But it still looks great on Blu-ray, whether you watch in 3D or 2D.